Seen mostly from Chilterns commuter trains, I expect Berkhamsted castle is one of those landmarks that is no longer noticed. It has disappeared into the landscape. My straw pole revealed a distant lack of awareness when asked when was the last time they visited Berkhamsted castle? 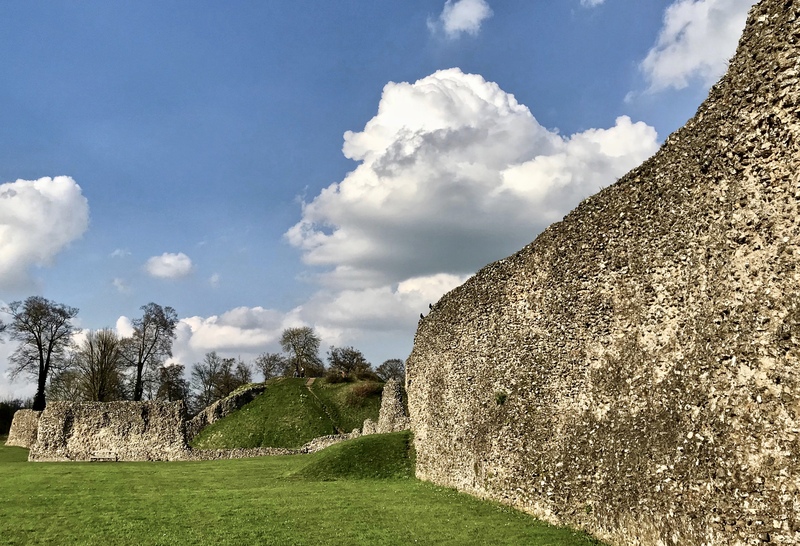 William the Conqueror received the submission of the English at Berkhamsted Castle after the Battle of Hastings in 1066 and it was his half-brother, Robert of Mortain, who built a timber castle here around 1070. Built in the classic Norman motte-and-bailey style, with defensive conical mound and oval bailey below, the castle formed part of the Conquerors ‘ring of steel’ around the capital (along with Wallingford and Windsor Castles to the west, and the White Tower to the east), controlling trading routes and successfully subjugating the locals. The castle saw action in the Middle Ages, invasion by the French, civil war and in more settled times, the site of a royal residence. But the castle slid in a slow decline of unsuitability for royal use, and by default became unfashionable. Stone was taken from the castle and reused to build many houses and buildings in the nearby town. The fortunes of Berkhamsted are closely linked to its castle; whose fortunes waxed and waned, and when it waned and fell into disuse in the 15th century, the town had to find a new way to survive this change in its fortunes, but they had to bide their time until the arrival of the inland waterways and railway in the 19th century. Now a scheduled ancient monument, protected by law, the castle had a lucky escape. Victorian railway designers sought to build the London to Birmingham Railway directly through the site but was saved by local opposition. The Act of Parliament that authorised the construction of the railway also protected the castle, making it the first such property to be protected by law. We have not always been so proactive in protecting our heritage however, as landowners believed they had the absolute right to destroy their properties, and the notion the state could stop someone doing whatever they wanted to their own property was seen as ridiculous at the time. That Britain’s heritage was worth preserving was a belief held by weirdos, but thankfully for us, after witnessing decades of mindless destruction MP’s and heritage pioneers became determined to act. I can’t help thinking of the new HS2 rail infrastructure project that will tear its way through ancient woodland and Chilterns countryside in the near future. Incredible to even consider now the destruction of our heritage in the name of progress, or in the case of spite, from the infamous Reverend Francis Gastrell, owner of New Place, William Shakespeare’s final home in Stratford-upon-Avon. He bought the house in 1753 but “quickly got irritated with tourists wanting to see it”, says architectural historian Gavin Stamp. Gastrell was already in the town’s bad books after chopping down a mulberry tree planted by Shakespeare. But he hadn’t finished there: in an extraordinary fit of spite, he demolished the house in 1759. It was never rebuilt and only the foundations remain. Suffice to say he was kicked out of town! Arial view of the site taken in the 1940’s. Image supplied by Britain from Above archive. Seen mostly from the commuter trains, I expect this castle is one of those landmarks that is no longer noticed. I think we need to rediscover our Chilterns’s castles, visit them, watch as they reflect the changing seasons; through the windows of your train or car. Take a picnic, take your family, take your dog and enjoy the space and possibilities on offer. To explore other Chilterns castles, including Someries in Luton, take a look at these pages. Suggestions needed for additional material here too. How a wild boy without a birth name, who was found in a German forest, was adopted by a English king and came to live in the #Chilterns, is an astonishing story. 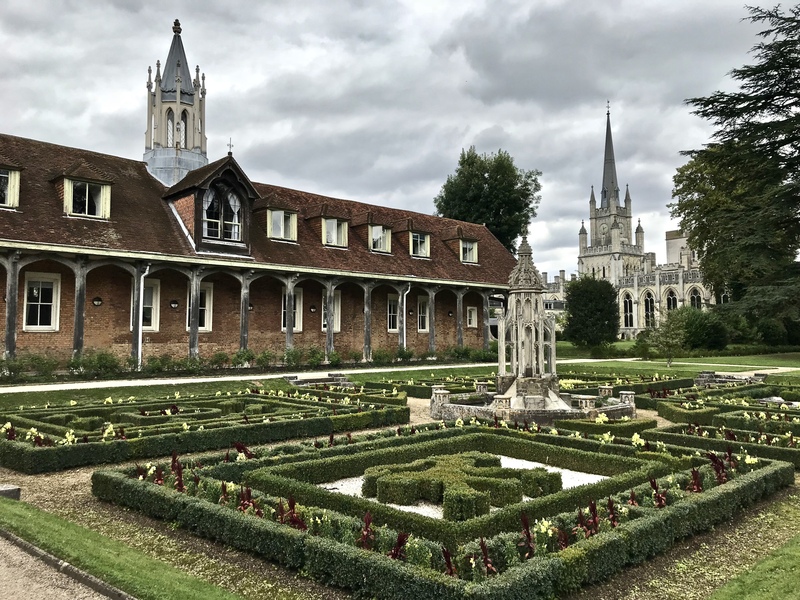 The monastery and monks are long gone, buildings destroyed, treasures looted and the monks banished during the 16th century Dissolution of Monasteries on the orders of King Henry Vlll; read about the flourishing trade at nearby Ashridge. 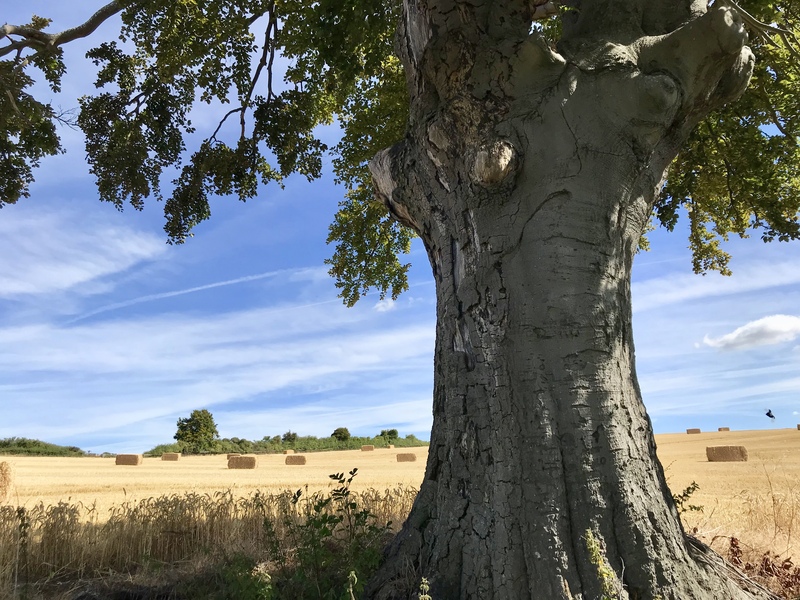 No previous Instagram nor Facebook posts have raised as many comments recently following a post that included the countryside around Little Missenden. The comments referred to the impending High Speed 2 (HS2) rail project will rip through this pretty Chilterns valley. We tend to look at a landscape and imagine how things were, or to enjoy the temporary transformation through the year (the focus of this blog); less so perhaps on how things might be. The Chilterns are a living, evolving landscape, shaped by its people, industries and natural resources. After all, nothing stands still, or is set is aspic. It is a moment for me to recognise the importance of capturing some of this huge change. HS2 is something I have ignored. This vast, expensive and disruptive engineering project is the brainchild of our government who think that spending upwards of £56b is worth the minutes shaved off the London to Birmingham rail journey is well worth it. Perhaps that should be the national priority, but it is above my pay grade to know for sure. There has been much written, much revised and many cross words exchanged however, but for me, HS2 is something I have ignored, until I walked in the Misbourne valley and appreciated the scale of what is about to happen. I have included a web link below, but to briefly summarise the route through the Chilterns; from London Euston, the route will enter a tunnel until West Ruislip, where trains emerge to run on the surface. From here the line crosses the Colne Valley on a major viaduct, and passes through a 9.8-mile (15.8 km) tunnel under the Chiltern Hills to emerge near South Heath, north-west of Amersham. The route will run roughly parallel to the existing A413 (through the Misbourne Valley), passing to the west of Wendover in what HS2 call a ‘green cut-and-cover tunnel’. After passing west of Aylesbury, the route will run north westwards through North Buckinghamshire and Oxfordshire, South Northamptonshire and Warwickshire and into the West Midlands. The River Misbourne rises above the lovely market town of Great Missenden and flows south east for 17 miles (27km) through the village of Little Missenden, onto Amersham and the Chalfonts to Denham, where it meets the River Colne. This valley and its river are no stranger to controversy and has suffered damage to its natural and built resources; most recently the natural chalk stream was rescued by a successful campaign to stop the abstraction of valuable drinking water and further down the valley, Shardeloes mansion, ancestral home of the Tyrwhitt-Drake family was saved from demolition by the formidable Amersham Society. I was drawn to the valley when I read a piece about rare medieval wall paintings uncovered by accident (aren’t all the best things? ), in 1931 that had been hidden behind lime wash and plaster and are now restored inside this wonderful 1,000 year-old church. Still a valuable community hub inside a building designed, built and tinkered with by the Romans, Saxons, Normans and Tudors. I expect the Victorians had a hand in there too. My walk took me from the parish church, through the village, up the hill to Mop End and down through the woods to Shardeloes, just outside Amersham and back to Little Missenden along the South Bucks Way. Details and maps are below. It was a beautiful still January morning, relatively quiet, with only bird chatter in the hedgerows for company. Leo and I crossed the field behind the village and joined the leaf-strewn sunken path, with helpful winter breaks along a familiar tree-lined boundary to enjoy far-reaching views back across the valley towards Great Missenden. Our guides, a couple of fighter-pilot blackbirds, skilfully navigating the twists and high speed turns upwards along the path. We passed an enormous pile of gently smoking, freshly dumped manure, ready to spread across these busy fields. There are a few isolated cottages with their lovely gardens, views and one sporting a tennis court! Not too many ‘gerroff my land” signs tacked to the trees either, which is always reassuring. Our way downhill towards Amersham is cleared by the squirrels, their grey tails catching the sunlight as they race across the woodland floor, over logs, along a decaying fence and up the nearest tree, as fast as their little legs will take them. The vista then opens up and you can appreciate the sense of space and place as the landscape turns from natural, to managed and designed. Enter landscape designer, Humphry Repton who was commissioned to lay out the grounds in the classical English landscape fashion, in the lee of the hill upon which the Shardeloes mansion stands, damming the River Misbourne to form a pretty lake. Shardeloes was the ancestral home to the Tyrwhitt-Drake family until the Second World War, when the house was requisitioned as a maternity hospital for pregnant women from London, saw some 3,000 children born there. Amazing! Following the War the house seemed destined to become one of the thousands of country houses being demolished, until the formidable Amersham Society, assisted by the Council for the Protection of Rural England fought a prolonged battle to save the house. Subsequently purchased in the early 1970’s by a local property developer who converted the house and outbuildings into a complex of private flats, with nearby equine centre and cricket club. I am reminded of another great regional railway project that saw Victorian railway designers, who sought to build the London to Birmingham Railway directly through the Norman Berkhamsted castle, but was saved by strong local opposition. The Act of Parliament that authorised the construction of the railway also protected the castle, making it the first such property to be protected by law. There is an expectation that the HS2 archaeology will be rich and varied; grasping at straws perhaps, but I am hoping there will be access and tours available so we can see for ourselves what is happening. From the conversations I have had, both professionally and in my personal capacity, the locals are now resigned to the railway, and will make every effort to minimise disruption to their businesses and lives. What is the Misbourne Valley going to look and sound like in the next decades? I will be back to find out as I will seek to harness and record the passions that these projects evoke with many more Instagram, Facebook and blog posts that encourage discussions and comments. You are welcome to comment below. This website has interesting plans and maps so you can see where the route is and where the tunnels are – not too technical either. There are three lovely walks to be enjoyed along the Misbourne valley, information can be downloaded here. “The best church I have ever seen (and I’ve seen a few! )” enthuses A Simms, from Paris who visited the lovely church of St John the Baptist Little Missenden. Their website and visitor interpretation are excellent, the wall paintings astonishing and is well worth your support. I believe they serve a mean cream tea in the summer! Explore the neighbouring market town of Amersham, with its enviable history of black lace, perfume and beer. Read about another fine Chilterns Doom painting that was saved by the Chilterns summer rain. The local market towns of Great Missenden and Amersham are worth a visit, not least of all to see the Roald Dahl Museum and Story Centre and the Amersham museum. This tale is full of contradiction, cruelty and the absurd; of a young ‘fanciful child of nature’ bought by a showman to exhibit to the public until his death and lavish funeral in a shared vault in a church in Marlow. Two weathered headstones bolted together in the All Saints Church cemetery in Marlow, are poignant evidence of a tragic tale of a mysterious so-called ‘Spotted Boy’ sold to be put on show for the paying public to gawp at. Intrigued to hear of the “Beautiful Spotted Boy of Marlow”, I arranged to meet Mike Hyde, volunteer and chair of the Marlow Museum. This is the place to go for all things Marlow, and their current Travellers’ Tales exhibition includes the fascinating stories of four historical people with local connections; Kate Marsden, explorer, writer and nursing heroine, Sir Robert Hart, British diplomat and official in the Qing Chinese government, King Zog, exiled King of Albania and George Alexander Gratton, aka “the spotted boy”. It is the last on this list that I am writing about, the others are no less interesting, but for very different reasons. 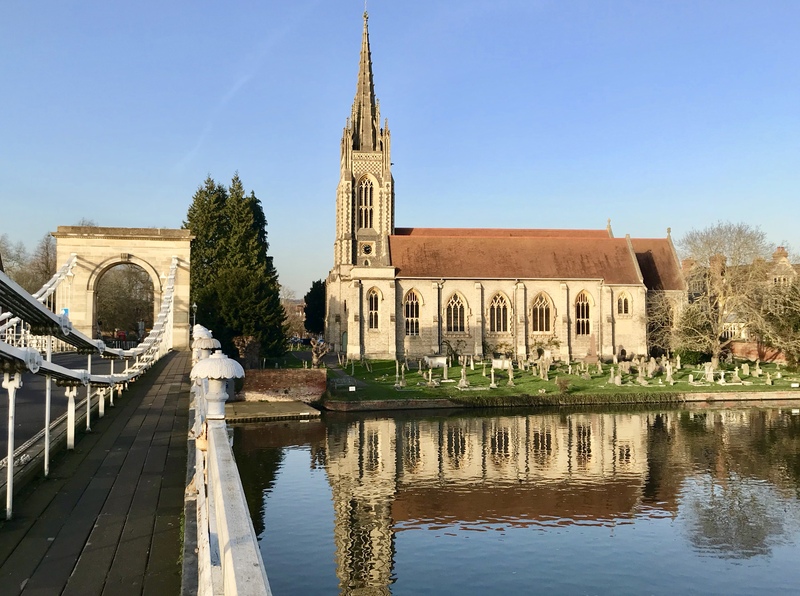 The spiritual home of rowing, Marlow is a well-heeled market town straddling the River Thames, east of Henley-upon-Thames and west of Cookham in the central Chilterns. Once a centre for lace making and timber, renowned these days for the many excellent restaurants and places to while away a few hours along the graceful Georgian high street, it is perhaps the combination of All Saints church spire and the William Tierney Clark-designed bridge that Marlow is most remembered. Modelled on similar designs to both the Hammersmith Bridge in London and the Széchenyi Chain Bridge spanning the Danube, this is its statement feature. This is the tragic story of a young boy born on July 24th 1808 on a sugarcane plantation on the island of St Vincent and the Grenadines, where it was customary for slaves to be given the family name of their owner or overseer: in this case, Mr Gratton was the overseer and the plantation owner was a Mr Alexander. King George lll was on the throne, so it’s my guess that would account for the boy’s first name. According to an 1819 edition of the Literary Journal, as a baby, George was shown in the capital Kingstown “at the price a dollar each person” before he was sent to Bristol. At the tender age of 15 months. Facts are hard to verify as it’s not known if he was accompanied by his parents, the circumstances of his sale and passage abroad the ship ‘Friends of Emma’ to England, and who in fact benefited from the 1,000 guineas that John Richardson, showman, paid for the boy. Richardson, formerly a farm labourer from Marlow, had left town to make his fortune running fairs and sideshows, typically earning as much as £1,200 in just three days. The reason the toddler was of interest to the showman? George suffered from a condition known today as Vitiligo. This a long-term skin condition is characterised by patches of the skin losing their pigment and becoming white. It is more noticeable in people of colour. One such fair is described so vividly by Charles Dickens in his ‘Sketches by Boz’ published in 1836: ‘Imagine yourself in an extremely dense crowd, which swings you to and fro, and in and out, and every way but the right one; add to this the screams of women, the shouts of boys, the clanging of gongs, the firing of pistols, the ringing of bells, the bellowings of speaking-trumpets, the squeaking of penny dittos, the noise of a dozen bands, with three drums in each, all playing different tunes at the same time, the hallooing of showmen, and an occasional roar from the wild-beast shows; and you are in the very centre and heart of the fair. Richardson bought the boy to add to this travelling horror show, where he was advertised as ‘a fanciful child of nature, formed in her most playful mood’. He was exhibited during the intervals of plays and other entertainments, sometimes for upwards of 12 hours a day. Venues included the famous Bartholomew’s Fair in Smithfield, London. Two weathered headstones bolted together in the cemetery of All Saints Church in Marlow are poignant evidence of a tragic tale of a young boy purchased for 1,000 guineas to be put on show. This tale is full of contradiction, cruelty and the absurd as it is said that the childless Richardson formed a bond with the boy, he even had him baptised George Alexander Gratton and brought to Marlow where he lived as his son. Around five years of age, on February 3rd 1813, his brief life came to an end, with all manner of speculation to the cause of death. Richardson was alleged to have kept the body for fear it would be stolen, until he could be interred in a brick vault in the cemetery at All Saints with a funeral it is said, full of pomp and circumstance. Before Richardson died in 1837, he requested he be buried in the same vault, with the two back-to-back headstones bolted together. Upon entering the impressive church, filled with winter sunshine, the experience was marred by a loud mobile conversation on an iPhone from a visitor doing a sweep of the church. Had to tick this sight off the bucket list, and was oblivious to the oil painting that Richardson had donated to the church. Over time, it fell into a state of disrepair and was restored about 10 years ago. It now hangs near a small display at the back of the church. Above the toilet door. Unnoticed. George Gratton, painted by the artist Coventry that still hangs in All Saints Church. I think it only right we show George the dignity he deserves and identify him by his given name, not his ‘circus name.’ We don’t after all know his birth name, nor who his parents where. We know very little about him. It is a difficult tale to digest and tell here, not least of all with the grotesque and offensive 19th century attitudes and some insensitive use of contemporary language. I am of course viewing this sorry tale through the prism of 2018 enlightenment and my experience as a mother; I can’t help but not feel the tremendous sadness and subsequent loss at their parting – did she know what happened to her son? His agony at not being with his parents. So far from home, paraded around town with Richardson, put on display for upwards of 12 hours at a time, what life was this for any child to have to endure? Perhaps his early passing was a blessing and a relief for him to find some peace. Sadly, there is no indication of where these graves are. I wondered if we, the community, can begin to afford George the dignity in his memory, that he did not have during his brief, tragic life and place flowers on his grave, as is still done for another of the Chilterns prodigal son’s – on Peter the Wild Boy’s grave in Northchurch, near Berkhamsted. How wonderful then that the Marlow Museum has included George’s forgotten story in the Travellers’ Tales exhibition, I recommend you visit and find out more. They are also working with the Saint Vincent & The Grenadines 2nd Generation (SV2G) on a Heritage Lottery-funded project that seeks to uncover connections between Marlow and High Wycombe to deliver a new programme of Vincentian heritage events to commemorate the tragic life of this young boy, believed to be one of the earliest (if not the first) recored Vincentian’s in Britain. I am looking forward to finding out more about these links and the communities that have made their home in the Chilterns. Travellers’ Tales with Marlow connections is on at the Marlow Museum. Find out more about All Saints Church and perhaps if you visit, ask where the grave is, as I couldn’t find it. Explore the naturally outstanding Chilterns and the market town of Marlow or take a walking tour of the historic town centre. Discover more Chilterns Churches, ideas for winter wanderings and for the spring, the unique and bonkers Swan Upping ceremony that is best enjoyed from the riverside at Marlow. Getting to Jane’s studio meant being rained on by beechnuts as we set off from nearby Christmas Common to walk through the quiet autumnal beech woodland, once full of the smell of charcoal burners, the sounds of wood cutters, the sight of wartime tent peg-makers and wood gathers from surrounding hamlets picking only what had fallen to the ground. Getting to Jane’s studio meant being rained on by beechnuts as we walked through the quiet autumnal woodland, once full of the smell of charcoal burners, the sounds of wood cutters, the sight of wartime tent peg-makers and the wood gathers from surrounding hamlets picking up only what had fallen to the ground. The Hambleden Valley is a glorious space. 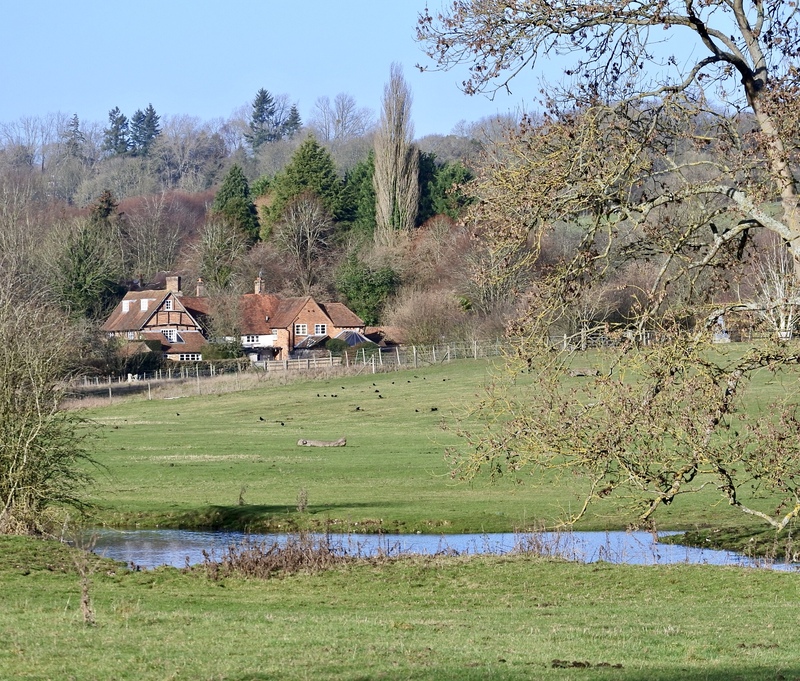 It’s typical Chilterns countryside that has made it a favourite of TV and film directors, this beautiful valley synonymous with Chitty Chitty Bang Bang and the Vicar of Dibley – but I am showing my age, as it has also appeared in the Band of Brothers and more recently, Killing Eve. I was off to meet crafty siblings, John and Alice Nuttgens at their Idlecombe studio’s, just outside Turville along the delightful Holloway Lane – delightful only as long as you don’t have to reverse to make way for oncoming farm traffic! And then we were on to visit ceramicist Jane White, who lives and works near Christmas Common. I had joined the ‘meet the makers’ walk, thanks to my friends and colleagues at the Chilterns Conservation Board who organise the new twice-yearly Chilterns walking festival. It is no surprise these walks have proved so popular as they are a lovely way to immerse yourself in the beautiful and bountiful Chilterns countryside. Each outing comes with a walk leader who is packing not only insights and country lore that only a local can know, but sometimes with homemade cake too! 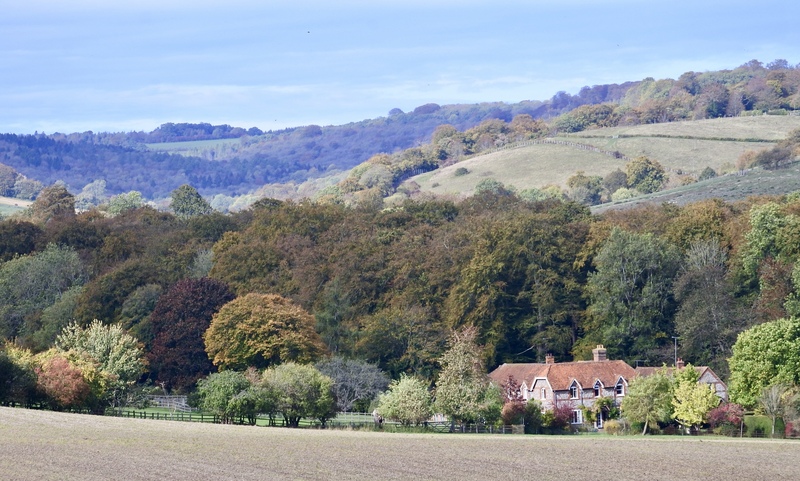 Down winding country lanes, only five miles north of Henley-upon-Thames, the tiny village of Turville is busy during the weekend. Busy with walkers and cyclists exploring the many trails and tracks that climb in and out of the Hambleden Valley. In contrast, weekdays are a good time to visit as it’s reasonably quiet, and it was down such a quiet lane I was to find Idlecombe Farm. Set back from the lane with low-slung sheds adorned with flowers, farming implements, chickens and enormous vegetables out front and back is where John Nuttgens ceramist and his sister Alice Nuttgens master saddle maker and fitter were to be found. John puts it succinctly when he says that the creative thread that binds the many talented Chilterns craftspeople together, is the distinctive landscape in which they work and is from where they draw their inspiration; undulating countryside, chalk streams, fauna, flora, flint and the many hilltop-crowned beech woods. This can be seen in the pieces he makes that are adorned with local flowers or mirror the autumnal colours all about us. John has been working clay since the 1970’s and came to settle in Idlecombe, in 2013 at which time he also established his studio and showroom alongside his sister Alice. Alice is a rarity; deftly using her hand-made tools, she is one of only 150-or-so saddle makers left in England. This is a craft I had never seen before and it was quickly clear why it takes seven years of training to make harnesses, bridles, belts, saddles and even bell mufflers for St Mary’s church in Turville. Getting to Jane’s studio meant being rained on by beechnuts as we set off from nearby Christmas Common to walk through the quiet autumnal beech woodland, once full of the smell of charcoal burners, the sounds of wood cutters, the sight of wartime tent peg-makers and the wood gathers from surrounding hamlets picking only what had fallen to the ground. Our path followed an old sheep trail once in use to move the animals to nearby Watlington and even further afield, to London. The last of the blackberries still tasted good and noticeable piles of track-side feathers meant I wasn’t the only one enjoying the woodland bounty! Jane and her sheepdog Binny (who was having the day off work), welcomed us to her pretty studio that once served as the old dairy, on an isolated farm deep in the Chilterns countryside. The dairy is typical Chilterns vernacular of red brick and flint, this is the location I dream of escaping to! Jane uses a technique to create her ceramics that I was also unfamiliar with; pit firing using organic materials including coffee grinds and seaweed combined with the transformative power of fire, that renders the clay into a myriad of different patterns and colours. Each piece unique. Jane explained that she is constantly striving to create forms that mirror the simplicity and balance evident all around us in the natural world, in the Chilterns. On the path back, we have a conversation about how much organic lamb from the adjoining fields has been sold to Tesco. A lot it seems, which creates its own tensions for local business. Local producers can face all manner of obstacles getting their goods to market; lack of awareness, too often struggling with poor connectivity and technology, marketing, capacity, profile, competition and volume producers from other locations. But I am confident that there is a bright future for skilled Chilterns craftspeople who are creating new, unique goods that are grounded and shaped by something very special. Something that cannot be bought from far-off factories. Something they find in the naturally outstanding Chilterns landscape. So please support them when you can, their details are below. There are many glorious places to visit nearby including the National Trust’s Nuffield Place and the Wormsley Estate and Getty Library. Discover too, the Gentle Giants on Chiltern Ridges, sample the Tastes of the Chess Valley and watercress Tools of the Trade. 10 perfect pub walks in the uncrowded alternative to the Cotswolds or this 9.5 mile circular walk starting from the village of Hambleden, takes you past four local pubs. The Autumn walking festival has now finished, thank you to all those who took part, but save the date for the Spring festival – Saturday 18th May – Sunday 2nd June 2019. This post is my celebration of some of the many Chilterns trees I have encountered on my travels. Trees that have left an impression on me. Some I enjoy frequently as I go about my day, others not as much. More I am hoping to see. It is tempting to go for the big hitters in the forests, the sentinel trees, the obviously ancient, even those that have starred in Harry Potter movies. 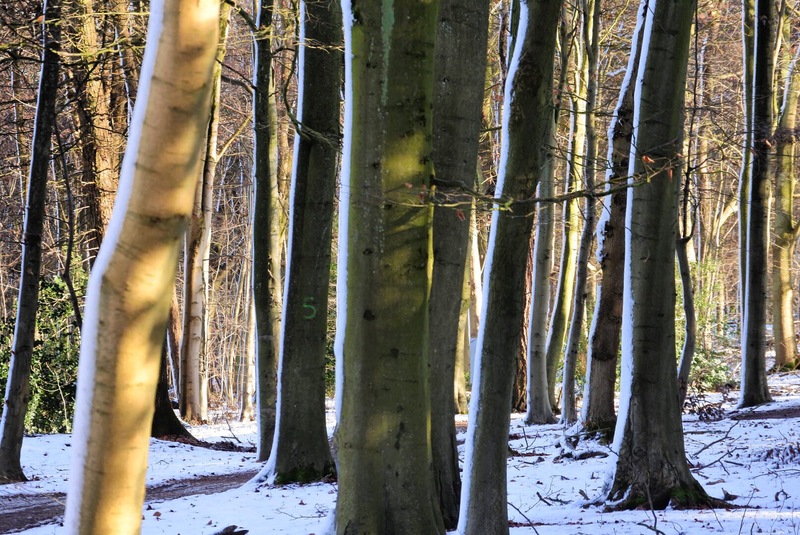 The Chilterns are synonymous with ancient woodlands, acres of forest, avenues of stately trees, big trees, growing trees, intriguing trees, memorial trees, even fallen trees. This post is my celebration of some of the many trees I have encountered on my travels. Trees that have left an impression on me. Some I enjoy frequently as I go about my day, others not as much. More I am hoping to see. If you have any favourites, please let me know where they are and why I need to see them for myself. “My name is Morus nigra, and I am very old. Please do not climb on me”. Silk worms eat the soft leaves of Morus alba but have no appetite for the leathery leaves of Morus nigra, the variety that produces such delicious black mulberries. So delicious in fact, visitors to Cliveden swear they have been nowhere near the tree through lips smeared with its delicious crimson juices. I often pass these entwined trees on a walk near Pitstone Hill. They have grown together so gracefully, their embrace quickens the heart. I stood and stared at a tree that just knows how special it is, with outstretched boughs that dominate the expanse of Ashridge House lawn. Perhaps I was drawn to it because I was reminded of an oak tree in my childhood garden? This oak however, was planted in 1823 by Princess Victoria to commemorate her visit to the estate. I took an acorn home for my son. This is a view familiar to those living within at least 10 miles of Ivinghoe Beacon with the lone tree on the steep north western slope. It’s a ‘watch tree’ with enviable views across the Vale and surrounding countryside, and a symbol for the Iron Age hill fort that once stood atop this hill. I see it almost every day. This lone hilltop barrow is a wonderful, mysterious place. There are plenty of stories and local legends of Roman villas and disinterred graves, all under a full moon, naturally. I understand why Paul Nash painted it as much as he did. He would still recognise it today. The seasonal spectacle that are the spring bluebells draw locals and visitors to the woods each April or May. It is easy to avoid the busy spots and sea of selfie-sticks to find a quiet woodland, which is where I noticed these unusual patterns on the exposed tree bark. This is a statement tree. It stands out on the general slopes of Tring Park and I will confess to this tree being my favourite (I have included it in my logo). I visit often with Leo, he lifts his leg at the base and I stand back and enjoy the swoosh and colour blur of the leaves in the wind! As ragged and cold as that day was, the skeletal trees dotted between me, Pitstone Windmill and Ivinghoe Beacon in the distance, define the contours and add interest to what would otherwise be a bleak view. The Chilterns does grand tree-lined avenues very well. The lime avenue in Tring park, the lime avenue at Cliveden and this formal avenue of beech and oak trees link the Bridgewater Monument and Ashridge House. This popular avenue looks splendid throughout the year, and when there is not quite so much mud, quiet time with your back to a knobbly tree trunk is a pleasant way to waste away an hour or two. The pretty village of Clifton Hampden is stuffed with thatched cottages, a pretty riverside with an impressive bridge, and a church with this graceful 152-year old cedar tree, grown from seed by the local vicar. The day I visited, the cyclamen were putting on a good show. I expect the same spot dazzles with snowdrops in the spring. That Nash had a close relationship with his subject matter is clear; he paints with clarity, scenes and items that are often overlooked as ordinary. Or plain and everyday. He has revealed how a clump of trees on a hillside says so much about ourselves. But therein lies the astonishing skill and beauty in his work. I got more than I bargained for when I visited the Wittenham Clumps, a favourite haunt of Paul Nash. I discovered not only inspirational countryside, but my knight in shining armour. Paul Nash (1889 – 1946) was a British surrealist painter, photographer and official war artist who captured with great skill, both the timelessness and serenity of the English landscape, that was in total contrast to the iconic images of turmoil and destruction he painted during both World Wars. Much has been written about Paul Nash and his younger brother John, and it is outside my skill set to provide a narrative of his great works. What I will share with you are some of the locations that inspired him and have in turn, come to inspire me. I have no copyright permission to reproduce any of his paintings here, so have included links to websites where you can see examples of his work below. Paul Nash was born in London, and grew up in Iver Heath in south Buckinghamshire. Thankfully for us, he didn’t take to figure drawing and was able to concentrate on capturing his landscapes with preferred elements of ancient history. Something Buckinghamshire and the Chilterns have in abundance including; burial mounds, barrows and brooding Iron Age hill forts. He had to travel to the coast for the glorious seascapes and Wiltshire for the standing stones at Avebury amongst other locations. He came to my attention when I first began to write about the Chilterns and have been captivated by his painting of Ivinghoe Beacon, somewhere I have photographed many times during my walks along the now familiar chalk paths and trails. That Nash had a close relationship with his subject matter is clear; he paints with clarity, scenes and items that are often overlooked as ordinary. Or plain and everyday. He has revealed how a clump of trees on a hillside says so much about ourselves. But therein lies the astonishing skill and beauty in his work. He captures these timeless landscapes that wouldn’t be unfamiliar to those communities who have lived and worked in and around them over the centuries. I joined artist Christopher Baines on one of his Nash Walks to the Wittenham Clumps, the site of an iron age hill fort on the Sinodun Hills, 18 miles west of Wallingford in south Oxfordshire. Chosen for security and dominance, the two Clumps are marooned in a sea of Thames Valley loveliness. Round Hill is the taller of the Clumps, and Castle Hill the site of the hill fort. Each is topped by a grove of trees, the lower of the two enclosed by an earth ditch and engineered embankment. The Clumps are surrounded by pretty villages, towers, Dorchester Abbey, manor houses, water meadows and the River Thames. Christopher told us that the Abbey contains an unusual treasure, but more of that later. From the top, we enjoyed far-reaching views over the River Thames, towards the Chiltern Hills to the north east, westward to south Oxfordshire and south to the Berkshire downs. The view was described by Paul Nash as “a beautiful legendary country haunted by old gods long forgotten”. There is a great wind up here, excellent for kites, the natural and man-made varieties, and model planes too, being flown. A third hill, Brightwell Barrow below, is just off to the south-east. This lone hilltop barrow I think is a wonderful, mysterious place. There are plenty of stories and local legends of Roman villas and disinterred graves, all under a full moon I expect. I can understand why Nash painted it as much as he did. He would still recognise it too. Nash believed that trees have their own personalities. The devastated trees he painted, that were blasted to shattered stumps, to him represented the fallen soldiers of the Great War. The trees on the Clumps are not without their stories and quirks too. Christopher showed us the initialled tree trunks on Round Hill that reminded me of the similar declarations of love on Sharpenhoe Clappers in the northern Chilterns. Another wooded hilltop that still draws people today. I can’t help but wonder if the lovers are still in love? I have commented many times throughout this blog about the extent of Victorian Vandalism, evident in so many Chilterns churches, where earlier treasures where either ripped out or covered up to suit a more modern taste. Here was another example: local man Joseph Tubb, who infamously worked over the course of two weeks in the summer of 1844, and scratched onto a beech trunk his uninspiring 20-line earthly musings. The ‘Poem Tree” as it become known, recently collapsed into a pile of decay, but sadly for us, his poem lives on in the little monument nearby. If you want to read what it says, you’ll have to climb the Clumps. Inspired by Christopher revealing the many threads that link Nash with what I had seen, I set off on to find a knight in shining armour. On my way to Dorchester Abbey, I stopped at some of the villages I had seen from the Clumps including; Long Wittenham with its pretty cottages, Clifton Hampden which is stuffed with even more thatched cottages and a church with an impressive 152-year old cedar tree, before parking at the edge of Dorchester-upon-Thames to walk the pretty high street. A Ceder grown from a seed planted in 1866. What an amazing Abbey! Unexpected, grand in scale, but not grand in nature. Busy with a large wedding, the guests waited to greet the bride’s family before flowing outside, relaxed and talkative, to wave off the bride and groom in a gorgeous vintage Rolls Royce. I was there to see the wonderful, unusually life-like effigy, one of the finest pieces of 13th century funerary sculpture in England. The pose is fluid as the Knight is ready to unsheathe (the now lost) sword. Much admired by 20th century artists including Henry Moore, John Piper and Paul Nash, who considered the effigy one of the greatest icons of Englishness – alongside Stonehenge. That’s quite something! Just as when I visited the Tate in 2017 to see the Paul Nash Exhibition, I got more than I bargained for on this visit to the Clumps. Not just beautiful English countryside and villages, but a sense that things haven’t changed all that much. Sure, we do things differently, but the essence of who we are hasn’t changed. Places of worship still have a role, we commemorate our dead, plant and harvest crops, have a fascination with the unexplained, are drawn to rivers and high places, leave something behind by scratching our initials (or a poem) onto trees, indulge in celebrations and capture what we see in prose and pictures. In doing so, we try to understand and make sense of our place in this enduring landscape. A trip to the Clumps could perhaps help you try and figure out some of life’s great mysteries. Paul Nash is buried with his wife Margaret at St Mary the Virgin, Langley Marish near Slough. Thank you to Christopher Baines for sharing his knowledge and insights into how this pioneering artist tried to make sense of the magical and mystical everyday. It was really special. Take a look at his website, which is full of information on the local area and of the great man himself. This blog has plenty of ideas for places to discover and walks to enjoy throughout the Chilterns year, follow the tabs at the top of the page to discover more. In Chiltern Fields was published in 2017 to commemorate the 100th anniversary of the Battle of the Somme. Further information and to view a selection of Paul Nash paintings at the Tate Gallery. Just like an antique rug, with unravelled threads, blemishes, bald patches and stains, once you begin to look, you see these Ashridge threads in fact link across the Chilterns, even the nation, presenting a tantalising picture of this wonderful place and its story. Ashridge gardens are a magical place of mythical puddingstone’s, Totternhoe stone, Humphry Repton and an acorn from a queen. Each time I visit Ashridge, I am inspired by the stories I uncover: religious relics, sunken lanes, a landscape of contrasts, abandoned masonry, animal trails, a vineyard, the wild and the managed. All within a glorious 5,000 acres of Chilterns woodland. Fan vaulting and tracery on the ceiling of the tower, with a dial that displays the position of the weathervane on the roof. Ashridge Gardens extend an impressive 190 acres across a reasonably flat site in an otherwise undulating and hilly landscape. Lancelot ‘Capability’ Brown designed the northern and eastern part of the gardens and famous Golden Valley. It is the gardens south of the house, originally designed by Humphry Repton (1752 -1818), in the early 19th century, that we were here to explore. In good company, Repton, William Kent and ‘Capability’ Brown share the honour of being the three most famous 18th century landscape designers and gardeners. From 1808 to 1813 the architect James Wyatt crafted, from local Totternhoe ‘soft’ stone and lashings of flint, an Ashridge House to claim the high-point above the undulating Golden Valley and surrounding forest. The grounds to the rear of the house are dominated by the extensive lawn leading onto avenues of trees inviting you to explore further, with the promise of tantalising views of the surrounding area. On a closer look, the garden is made up of a number of smaller gardens and discrete areas, which have been the focus for Mick Thompson and his team. Working on the restoration of the Rosary, an Armorial Garden, the Italian Garden and the Flower Garden that have retained strong links with their designer and visionary, Repton. The county line between Hertfordshire and Buckinghamshire runs right through the garden, and is now marked by a puddingstone no less. Once disputed, with Buckinghamshire laying claim to more than their due, this conglomerate rock (that could be the icon of Hertfordshire), has symbolically won the day! You can see the puddingstone’s tumbled about the entrance to the grotto and souterrein tunnel that have been constructed using this very hard conglomerate. The estate has the largest collection of puddingstone’s, possibility the largest supply in the world! How and when they are formed is a mystery, but Hertfordshire folk have never been in doubt ̶ it grows, and then gives birth to new stones. This is because stones appear out of the ground, which has given rise to the names “Growing Stone” and “Breeding Stone”. A fitting addition to this garden. The Italian Garden and the arbour for the Rose Garden (now framed with laburnum trees), have been restored to their original design. What made it for me was the magnificent oak, dominating the lawn, its massive trunk and spreading limbs are just perfect. I stood and stared. Perhaps I was drawn to it because I was reminded of an oak tree in my garden when I was a child. This oak however, was planted in 1823 by Princess Victoria to commemorate her visit to Ashridge. How will it be commemorated in 2023? I took an acorn home for my son. Ashridge is a compelling story, made up of the majestic and the mundane. I just know I am going to go on following those loose threads and blemishes to see what they reveal. My visit was on a Repton Garden Tour, an event in the excellent Heritage Open Days programme organised by Jenny Sherwood of the Berkhamsted Local Historical & Museum Society and led by the charming and knowledgeabe Mick Thompson, head gardener at Ashridge House. Thank you both. I must confess that after this delightful garden tour, I still can’t remember many plant, shrub nor tree names! Apart from the oak, that really caught my eye. But that says more about me than it does Mick. Information on tours of the house and gardens can be found here. Holy relics were once big business, read about the Ashridge relics here. Book a table for lunch at the popular Alford Arms in nearby Frithsden. The first gin distillery in Hertfordshire, named after the iconic stone, can be found at Wilstone Reservoir, just five minutes from Tring. Take a walk around the medieval stone quarry at Totternhoe, seven miles from Ashridge. And if that’s not enough, further Chilterns inspiration and itineraries can be found here. We seem to have lost a month, August feels like September, then parched landscape offering up wild berries ready to pick, and the barley bales dot-dash-dotting the fields. We seem to have lost a month, August feels like September, the parched landscape offering up an early feast of wild berries ready to feast on, and harvested barley bales dot-dot-dashing across the fields. In years to come, we’ll be saying “oh it’s never as hot as ’18” in reference to the benchmark that once beat all heatwave benchmarks – the summer of ’76. Even that infamous summer heatwave has been trounced. I am used to the looks of pity, once I confess to not having shared this great cultural experience. Well, this year has really strained those weather conversations to the absolute limit. We’ve had the icy ‘beast from the east’ and are just stumbling and sweating our way through the hottest summer. Ever. Scorched earth is the new summer look; shades of brown, yellow, dead (apart from the weeds), hard baked, cracked earth. Whatever happened to those green fields that visitors flock from all the world to admire? Did they imagine the Chiltern prairies as their planes touched down at the start of their English country holiday? We don’t show off our best side in the heat, and the national obsession has been taken to new levels; replacing the low-level grumbling that ‘it’s too wet, not wet enough, too cold, spring is too early, too late, there’s been no spring, and it’s definitely far too hot’….you get the gist. Across the northern hemisphere, people and the land have been baking in this prolonged and extreme 2018 summer season. Minds far greater than mine will be calculating if this is what climate change looks like, with temperature extremes that bring wild fires, drought, storms, infrastructure pressures and failures, even death. The effect on the parched landscape has been dramatic. Some rivers and chalk streams have continued to flow following the long wet winter, but enough impact that has seen Crestyl Watercress farm at Sarratt closed since early June for over two months. Even the duckpond at Albury is bone dry. The seasonal wildflowers came and went through their spring and summer palette far too quickly, with Queen Anne’s lace left to pretty much carry the can, while the rest finished up and went home early. None of those hardy slugs either, such a summer feature that do a sterling job cleaning up the countryside (and each other), are nowhere to be seen. We seem to have lost a month, August feels like September, the parched landscape offering up wild berries ready to pick, and the barley bales dot-dot-dashing across the fields. In the past few weeks the emergence of the end of summer berry-bounty that festoons the hedgerows and along the pathways with blackberries, sloes, hawthorn, rose hips and elderberries ripe for picking. The blackberries are lovely, although a bit undersized. I’ll cope. 2018 really is the summer that just keeps on giving…but I suspect we would secretly prefer those middling damp summers, green countryside and wet picnics, that means we can gently moan that a few days of summer sunshine wouldn’t go amiss! What will the autumn have in store? For further inspiration on what to see and do in the naturally outstanding Chilterns or to read more summer tales, plus the wonderful story ‘A Reason to Love the Rain, which tells of what some wet weather really can do.